FOR three years, Gavin Sheehan has been itching to race Cole Harden over steeplechase fences because he thinks the horse could be that ‘special’. Today, the jockey gets his wish. Wetherby’s Constant Security Services’ Novice Chase might be a modest affair – but it will reveal whether this fantastic front-runner with the heart of a lion can make a seamless transition from hurdles to larger obstacles. 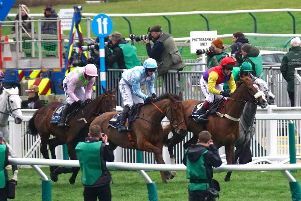 The galloping track will always have a special place in the Cole Harden story – it was here that Warren Greatrex’s stable star won the 2014 West Yorkshire Hurdle en route to victory the following March in the World Hurdle at the Cheltenham Festival when the gelding led from start to finish under a nerveless Sheehan, who timed the pace to perfection. There are no guarantees – the biggest certainty of all in racing is its glorious uncertainty – and Grade One hurdler One Track Mind, who Sheehan and Greatrex hold in similarly high regard, never recovered from a first fence error on his novice chasing debut at Newbury just over a week ago. Yet, while today’s two-mile-three-furlong test will be shorter than ideal for Cole Harden, whose best form is over three miles, connections are simply keen for a confidence-boosting run without having to take on rivals as precocious as Thistlecrack, who won this year’s World Hurdle and is ante-post favourite for the Cheltenham Gold Cup. With just three rivals, Cole Harden has every chance to win for the first time since his Cheltenham heroics of 2015. Though he never ran a bad race in his three starts last season, including two battles with Thistlecrack, he did not get his head in front and the horse’s well-documented wind problems – he has undergone several procedures to improve his breathing – were compounded by a niggling knee injury which needed time to heal. “He just didn’t feel the same horse last season,” confided Sheehan, who is encouraged by Cole Harden’s recent well-being at the Uplands Stables in Lambourn, synonymous with legendary trainer Fred Winter. Yet the 2013-14 champion conditional, who served his apprenticeship on the ferociously competitive pony racing circuit in his native County Cork, says there are genuine grounds of optimism after schooling Cole Harden over larger obstacles. “No-one else is brave enough or stupid enough,” jokes the 24-year-old, who remains all too modest about his riding and horsemanship. If Cole Harden had his way, says Sheehan, the seven-year-old would simply charge off until he stopped. With larger obstacles, he needs to be more measured and the slower pace of chase races may, he hopes, make it easier for his career-defining horse to stay three miles in future without causing undue distress. That is why the relationship between this horse and jockey is so important, with the rider likening today’s race to “first day at big school”. “He will be a little brave, and take on the odd fence, but he will learn,” Sheehan told The Yorkshire Post. After a humdrum day at Market Rasen, and a relatively quiet season by Sheehan’s high standards, the anticipation is self-evident in his voice as Cole Harden’s comeback dawns. “He’s the best horse to come through the yard and gave both Warren and myself our first Grade Ones,” said the jockey. “He’s a horse that doesn’t know when he’s beaten. “He wasn’t the same horse last season, but his wining time in the World Hurdle put him up there with many winners held in a higher regard. “I’m having a quieter year. Some of Warren’s horses are needing their first run. The ground hasn’t helped – it’s gone from good ground to heavy ground to dead ground in a short space of time. And dreaming about more glory days with Cole Harden. “He’s my special horse,” adds Sheehan. He truly means it.